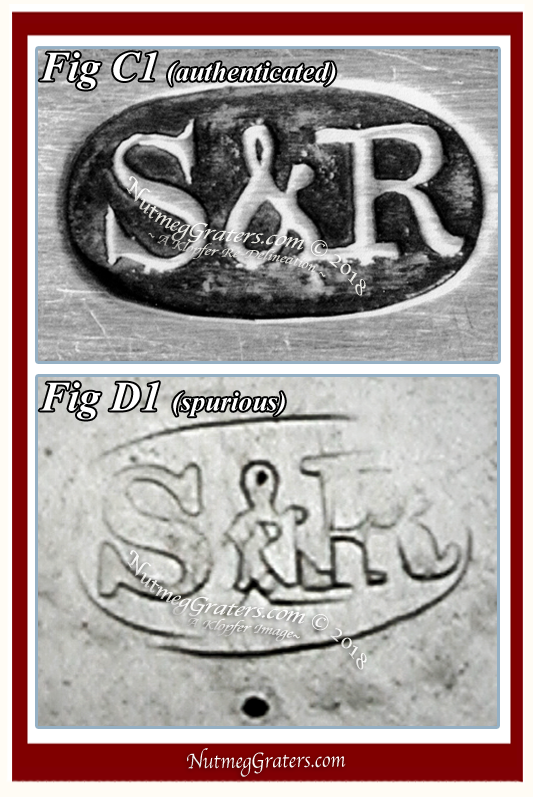 "S & R" maker's mark for Sayer & Richards of New York City (1802~1811/3) displayed irregularity in wear patterns. Noted after using macro photography, all the exterior surfaces of the nutmeg grater displayed consistent wear typical and expected to its age, except for the floor (back portion) of the maker's mark, which featured pristine parallel vertical lines that are absent of any similar signs in wear patterns (Fig E-b). Raising further concerns, what initially appeared as a double strike or bounce from a marking tool , was drawn into question because of an additional scratched guideline located slightly above the mark (Fig E-a). In the hope to resolve these concerns, this author contacted Silver Magazine, where an editor of the magazine indicated that they avoid the issue of "spurious marks on silver", but suggested posting these concerns on-line through SMP Silver Salon enabling viewer commentary. Posted on June 9, 2008, the responses from viewer proved less than satisfactory, yielding no meaningful results. This "Post" remains available at "Seeking to verify 'Sayre & Richards' hallmark" ~ SMP Silver Salon but is now closed from further public comment. 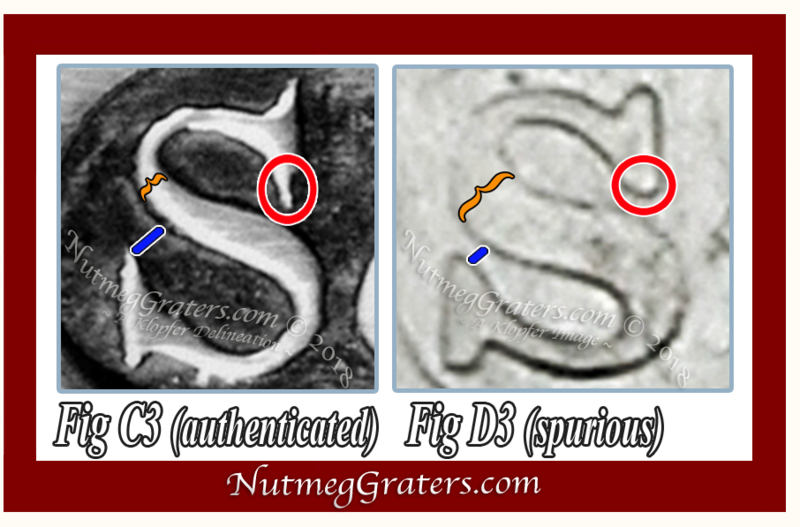 Stemming from this experience, NutmegGraters.Com later developed more comprehensive methods to authenticate maker's marks when found on silver nutmeg graters. Compiled for more than 30 years, the Klopfer Image File represents the documentation, study and image collection of more than 3500 silver nutmeg graters: [sources include but are not limited to ~ books and auction catalogs, on-line sales or auction archival resources, private and public collections.] This private file details nutmeg grater form, decorative styles, and marks. This data collection is useful when making comparative assessments, and creates a foundation on which to approximate a production period based on form and styling. Among silver nutmeg graters, the stubby~cylinder example under study is a less common form. Only eight examples are within the Klopfer Image File database. All eight are "plainish" in surface decoration. While two examples bear maker's marks attributed to Scottish silversmiths (one shown in Fig B), six examples are absent of any marks. [Keep in mind that NutmegGraters.Com did not independently examine nor confirm the two attributed Scottish examples; instead using the advertising literature from two well known auction houses.] 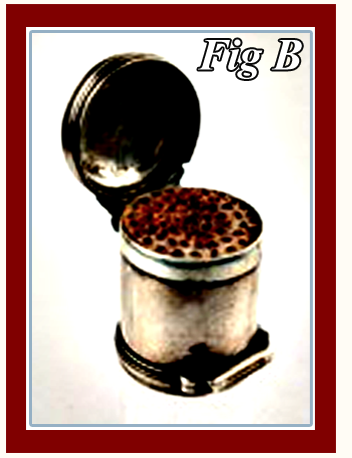 Based on styles, attributed dates for this form are between Circa 1780 and 1830 (which also coincide in Circa date to early cylindrical silver nutmeg graters having double hinges, fall-away side and top covers). This example is beautifully made, having rounded-lip edging encompassing the grate, a feature dating after 1800 (See Fig A-1). Based on English Statutes at Large, in Britain silver nutmeg graters strictly required full hallmarks as of 1790, while Scotland remained less well regulated. 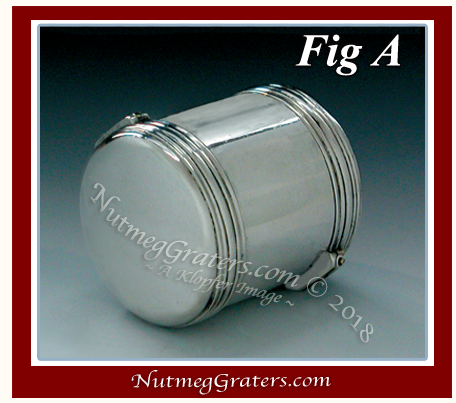 This stubby~cylinder nutmeg grater with double covers hinged at each end (Figs A & A-1) was purchased from Ann Gillooly of Robert Jackson / Ann Gillooly, Inc., 4897 Landisville Road, Doylestown, Pennsylvania 18901 in 2008. It was described as a "Nutmeg Grater by John Sayre & Thomas Richards, New York City, 1802-1818; 1³⁄₈" high; Cylindrical shaped Nutmeg Grater with a hinged lid and hinged base. Marked inside the lid 'S&R'." Also included, the seller wrote, "There is no provenance on the piece other than it came out of a private collection of American Silver on Long Island. The collector, however, does not wish to have his name released." Prior to 1840, references describing "nutmeg graters" in New York City are essentially non-existent. Only in 1767, one New York City advertisement is known for "Charles Shipman, Ivory and Hardwood Turner", which includes the manufacture of "nutmeg graters" as one of his products. The study of wills, probate records, silversmith's logs, etc. have provided no meaningful leads to production, sale and ownership of silver nutmeg graters in this region before 1840. According to Henry Glassie, food culture in America varied geographically between "regions", thus the absence of silver nutmeg graters in New York City (prior to this time) may be that they simply were not used in this region [ America Eats, Forms of Edible Folk Art, William Woys Weaver, 1989 ]. Or, silver nutmeg graters, implements for the wealthy, simply evaded inclusion within historical documents; or, these items ceased to exist after the wealthy fled New York City at the conclusion of the Revolutionary War ~ earlier records becoming lost. In any case, there is no supportive documentation that John Sayre & Thomas Richards (active partnership Circa 1802~1811/3) actually made nutmeg graters as part of their product line. NutmegGraters.Com acquired several authenticated examples of the Sayre and Richards "S & R" maker's marks [original sources include Winterthur's Decorative Arts Photographic Collection (DAPC), ancestry.com, Marks of American Silversmiths in the Ineson-Bissell Collection Louise Conway Belden, as well as other originations]. 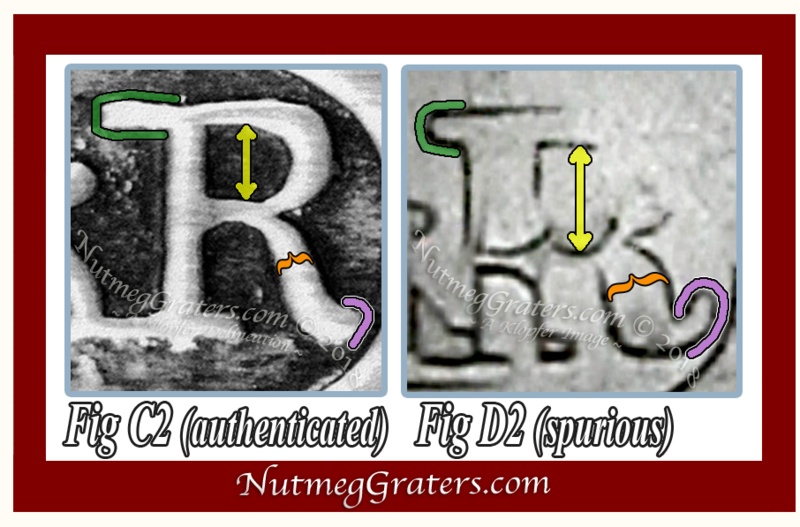 Using direct visual comparison between the authenticated mark (Fig C1) contrasted against the Canon MP-E-65 (a direct reflective lighting) image of the maker's mark under investigation (Fig D1) significant differences become apparent. When contrasting these two marks (Figs C2 & D2), there are numerous differences seen. First, observe the letters 'R'. Viewing the "confirmed mark" (Fig C2), the right leg of letter 'R' is thin, while the same leg with the counterfeit 'R' (Fig D2) is thick [shown using orange parenthesis]. Secondly, the right leg of the "authentic mark" (Fig C2) turns slightly outward to terminate in a blunt tip; while the counterfeit example inappropriately terminates with an upward turned "toe" or "tail" [outlined in purple]. Another problem regards the "serif" [outlined within green bracketing]: the authenticated 'R' (Fig C2) has a fully extended "serif", typically seen with letter 'R' among the "maker's marks" of this silver period; while the "serif" on the problematic 'R' (Fig D2) is atypically short and stubby. Lastly, the interior diameter of the "bowl" (also know as a "counter") is significantly smaller with the authenticated 'R' character (Fig C2) when compared with the spurious examples (Fig D2) [the yellow double-ended arrows display these differing vertical measurements]. Dissimilarities are also seen with proportions when comparing letters 'S'. The "spine" of the authenticated 'S' character (Fig C3) is much thinner and delicate than that of the spurious example (Fig D3) [as highlighted using orange brackets]. Contrast the spacing between the "spine" (or "body") and the letter's "terminal" (Figs C3 &D3) [shown by blue lines], the authenticated 'S' example (Fig D3) has a broader opening, while the spurious character 'S' is narrow. Highlighted within red circles, the "serif" with the authentic 'S' (Fig C3) terminates into a point, but with the "spurious" example (Fig D3) the "serif" is blunt and rounded. 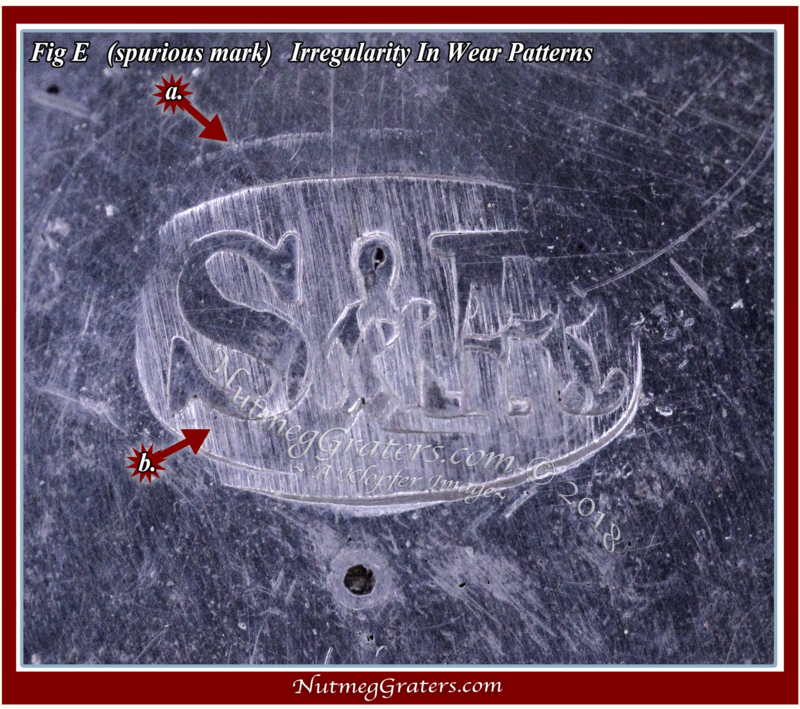 The Canon MP-E-65 (raking light) image of the maker's mark under investigation (Fig E) captures superb surface details to reveal additional irregularities within this mark. Photographed under very high magnification, the viewer clearly sees the misalignment within this mark, which initially gives the impression that the maker's mark was the double strike or bounce of the silversmith's marking die. However, above the mark is a curious scratched guideline or halo line (Fig E-a.) which may be someone's attempt at die realignment. It seems a novices blunder that when attempting to apply the maker's mark, the first attempt resulted only in a partial impression (notice the right side of the mark). In preparation to fix this problem, it seems a scratched guideline was made above the die's top edge in an attempt to provide an alignment guide before a second strike was executed using the die tool. More problematic, notice that the bedding (back portion) of the mark consists of parallel vertical lines (Fig E-b.). Although the surface around the mark is pitted and scratched from centuries of wear, there is no similar wear pattern to the bedding (back portion of the mark). "Note that each component of this piece exceeds the English sterling standard, lending strength to the possibility that it may be an English/Scottish grater rather than an American piece." "Based on copper [Cu], gold [Au] and lead [Pb] concentrations, this nutmeg grater is made from period silver [Ag]." "The concerns about the Sayre and Richards piece being English rather than American are also supported by alloy analysis." "S & R" mark in question against an authenticated maker's mark. Most problematic with the mark under study is its lack of any surface wear within the bedding (back portion), which is inconsistent to the wear observed throughout all its other surfaces. Further, a significant review of the literature indicates no documentation to support that Sayre and Richards ever produced or marketed silver nutmeg graters. The "fineness" quality with this silver nutmeg grater exceeds the British standard which in itself is characteristic of an English or Scottish (or possibly, French) origin. Based on the Klopfer Image File, the rounded-lip edging encompassing the grate is a feature dating after 1800; a time when British silver nutmeg graters were carefully regulated to require full hallmarks, but when marking Scottish silver remained less controled. Two similar stubby~cylinder silver nutmeg grater with two hinged covers bear marks of Scottish silversmiths. Although the current nutmeg grater remains the work by an unknown silversmith, not withstanding a forged "S & R" maker's mark, it is a period and antique piece. Evidence attributes this nutmeg graters as an early nineteenth century Scottish (or possibly French) example, being the work of an unknown maker. If you have a similarly marked item, we have interest to document and photograph pieces for further study.